GALION — Beware of ghouls and goblins and ninja turtles and princesses Sunday afternoon in and around the city as Galion celebrates trick-or-treat from 2-4 p.m.
Everyone should be careful during Sunday afternoon, from drivers to walkers to those who may let their pets out by themselves when kids and costumes are out and about. “Treat your kids to a safe costume, lots of supervision, and some healthy snacks along with the candy,” said Heather Trnka, injury prevention coordinator at Akron Children’s Hospital. With a little help from mom and dad, Halloween can be a fun-filled evening of imaginary scares. It’s the one night of the year when it’s necessary, even fashionable, for parents to have eyes in the back of their heads. Try face paint or make-up instead of a mask. If your child wears a mask, make sure it fits securely, allows easy breathing and provides adequate vision. Enlarge the eye holes if necessary. Have kids remove their masks when they cross the street. Avoid costumes that dangle or trail on the ground. Costumes should be warm and flame-resistant. Swords, knives and other accessories should be made out of soft, flexible material. Don’t let children cut across yards as lawn ornaments may be difficult to see in the dark. As trick-or-treaters roam the streets, the rules of the road must still be enforced. Even if it means dressing up like a traffic cop and joining the fun, parents should lead their parade of pint-size pedestrians safely into the night. Use reflective tape on your little goblin’s costume to make him more visible to motorists. Remind children to stop at all corners and look left-right-left before crossing the street. Urge children to walk – not run – on the sidewalk, facing traffic. Children 10 years old and under should never cross the street without an adult. Remind kids not to dart out from between parked cars. Drive slowly through residential neighborhoods and watch for children walking in the street or on medians and curbs. If older children go trick-or-treating without an adult, establish a time for them to come home. Give them a cell phone in case of an emergency. 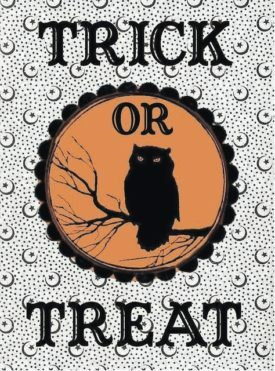 Trick-or-treat in familiar areas and teach children never to go into homes and cars. Check treats at home before they are eaten. Items not in their original wrappers should be discarded. Make sure kids are seated when they eat their treats. Choking most often occurs when a child is walking or running around with food. Knives, candles and children are a dangerous combination without appropriate supervision. The following tips will help ensure your children and their pumpkins keep smiling through the night. Small children should never carve pumpkins. Instead, they can draw a face with markers and parents can cut it. Children ages 5 to 10 can carve under a parent’s close supervision. Consider cutting the pumpkin open from the bottom. It makes it easier to level the pumpkin, and the jack-o’-lantern can be placed over a candle in a safe container. Lighted pumpkins should be placed on a sturdy surface, away from curtains and other flammable objects and should never be left unattended. Remove anything a child could trip over such as garden hoses, toys, bikes and lawn decorations. Sweep wet leaves away from sidewalks and steps. Keep a careful eye on those jack-o-lanterns displayed on porches, especially those lit with real candles. The pumpkins could be tipped over into dry grass or a child’s costume could brush the flame and catch fire.